Nicholas Salathe in Waveland, Mississippi. The evolution of what became known as the Katrina Cottage is a study in the design and construction of affordable housing. 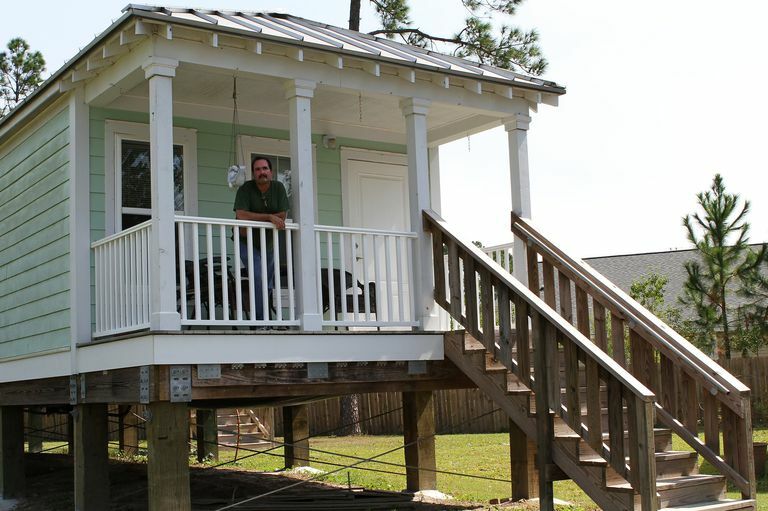 In 2005, Mississippi resident Nicholas Salathe lost his home in Hurricane Katrina, but he was able to build this affordable, sturdy new cottage that in 2012 weathered Hurricane Isaac without any damage. This photo gallery explores the Katrina Cottage and its variations, including the Katrina Kernel Cottage and Make it Right designs that stipulate sustainability. After Hurricane Katrina destroyed homes and communities along America's Gulf Coast, architects and designers developed cheerful, affordable, energy-efficient emergency housing known as "Katrina Cottages." Sometimes called "Mississippi Cottages," the first generation cottages introduced by Marianne Cusato were well-received at the 2006 International Builders Show. Architect and designer Marianne Cusato is well-known for plans inspired by America's rural architecture. A 300-square-foot home she called the "little yellow house" became the iconic Katrina Cottage, a prototype for rebuilding after the devastation caused by Hurricane Katrina in 2005. Constructed with decay-resistant steel framing and steel-reinforced wall board, Cusato's Katrina Cottage is just as much about construction and materials than design. The floor plan of the original Katrina Cottage consisted of three parts: the front living space, the middle area with plumbing (i.e., the kitchen and bathroon), and the rear bedroom space. This tripartite interior arrangement was practical, functional, and as traditional as Louis Sullivan's exterior tripartite design for tall buildings. Similarly, Cusato's exterior incorporated three large windows on the sides to demarcate the residential spaces. The Cusato design was so popular that Lowe's home improvement stores sold prefabricated kits, much like the Sears, Roebuck Company did for catalog homes at the turn of the 20th century. At one time, three sizes were offered by Lowe's: KC-1807, KC 910, and KC-1185. The Katrina Cottage Plans are no longer available at Lowe's. Katrina Cottage house plans can be bought directly from the Marianne Cusato website as well as from houseplans.com. Architect Bruce B. Tolar has created similar designs for houseplans.com. Cottage Square Lane in Ocean Springs, Mississippi has an assembled collection of these early Katrina Cottages. Architect Steve Mouzon thought he had a better idea. The second generation Katrina Cottages designed by Steve and Wanda Mouzon "are meant not only to be smaller and more charming, but also smarter...much smarter." The Mouzon Design "Katrina Kernel Cottage II" consists of a single long room. From the front door, you can see straight back to the rear of the house, a design resembling the traditional "Shotgun" style houses of the Gulf Coast At the far rear are doors leading to a bathroom and a walk-in closet. 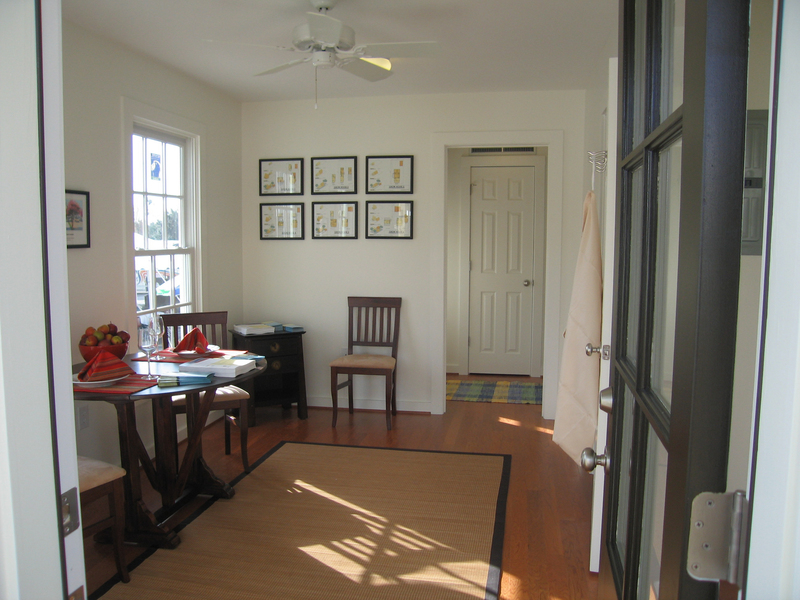 This Fairfax model is only 523 square feet, so the porch provides valuable living space. 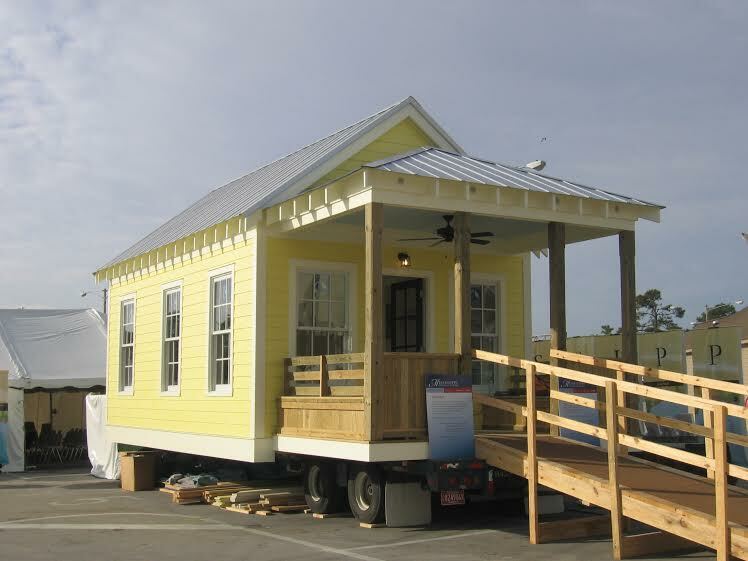 This Katrina Kernel Cottage model is constructed with light gauge steel for the roof, flooring, and studs. Steel resists fire, termites, and decay, but it's good practice to choose locally sourced building materials based on site location. The house is constructed from factory-made panels and could be assembled in two days. Why not save more money with a flat roof? The real reason for an attic is not for storing your Christmas decorations. Capturing and allowing hot air to circulate above and separate from the living area is a design decision for natural cooling living space — especially useful in southern climates to lessen air conditioning requirements. Air vents can be seen in this Katrina Kernel Cottage design model. Why the kernel? "Early Katrina Cottages didn't allow expansion very easily," declares Mouzon Design, "because exterior walls were so quickly used up for kitchen cabinets, bathrooms, closets, and the like. This was the first Katrina Cottage designed explicitly to grow easily." This is why it's called "kernel," like seed corn. The Katrina Kernel Cottage is semi-finished with interior "grow zones" in each corner of the simple design. With large windows and no built-ins, grow zones are the areas to attach additions. "This means that at whatever point the homeowner wants to expand, they can move the furniture out and do so," says Mouzon. "Windows can be converted to doors simply by removing the window and the wall below the window...the header above is already in place." Again, this "sprouting" ability is why they are called "kernel" cottages. An example of how this floor plan can be expanded is provided on Mouzon's Original Green website. Steve Mouzon is the author of The Original Green: Unlocking the Mystery of True Sustainability. "Beyond the obvious savings in building materials, there's a huge, three-pronged sustainability bonus that comes from building much smaller to begin with, then adding on later," says Mouzon. The energy cost to heat and cool approximately 500 square feet is very viable for most budgets. Windows on both sides provide cross-ventilation and loads of natural light, which can save even more. "Finally," says Mouzon, "if the designer really does their job and the cottage lives much larger than its footage, people might just discover that they don’t need to add such a big addition when it comes time to expand." Mouzon sells digital copies and licenses to construct from his website. The living area of this Katrina Cottage has no interior walls. Instead, square pillars and long curtains frame a space used for sleeping. The Murphy bed can be folded up against the wall during the day. The flooring is natural bamboo. Grow zones are on each side of the bed alcove. A pedestal sink in the bathroom saves space and suggests old-fashioned charm. Floor to ceiling tile brings a sense of luxury, but tile is also more durable than less expensive plastics. The compact kitchen is built along one wall. All the appliances are cost-saving "Energy Star" compliant. But sustainable, green design is much more than providing the right appliances. Although designed for a tight budget, quality materials are used to construct the Katrina Kernel Cottage II. In 2005, the trailers provided to hurricane victims by the Federal Emergency Management Agency (FEMA) cost about $70,000. Mouzon estimated that his prefabricated design made from quality materials would retail at $90,000. The front porch of this Katrina Cottage extends the living area of a small home. An inexpensive ceiling fan from a big-box store like Home Depot brings cooling breezes to the front porch. Doric style columns bring old-fashioned charm to this version of the low-cost Katrina Cottage. The front gable forms a pediment bringing a Greek Revival flavor to the simple, Shotgun Style cottage. The porch decking is made with decay-resistant trim boards made from recycled plastics. Architect Steve Mouzon borrowed a traditional pattern when he designed the porch railings. Attention to architectural detail seems like a small thing, but even a balustrade can turn an ordinary functional element into a thing of beauty. Durability is also part of sustainable design. The exterior siding of this Kernel Cottage is Cementitious Hardiboard, which resembles wood but provides the fire- and water-resistance of concrete. After Hurricane Katrina devastated America's Gulf Coast in 2005, Steve and Wanda Mouzon, Andrés Duany, and others created and self-funded what has been called the Katrina Cottages movement. The original goal was to design an emergency shelter that was more beautiful, dignified, and sustainable than a FEMA trailer. Building dignified shelters for people in crisis was not a new idea — in fact, architects like Shigeru Ban had been doing it a decade earlier. The New Urbanist approach, however, was a growing movement in the United States. Japanese-born Shigeru Ban was but one of the architects enlisted by actor Brad Pitt's Make it Right organization. In the absence of an organized, planned rebuilding of the lower Ninth Ward in New Orleans, Pitt put his star power behind the vision of building healthy communities around the world — starting in New Orleans. Sustainable communities are built with affordable homes of high-quality; the construction is environmentally sustainable; the philosophy adheres to architect William McDonough's Cradle-to-Cradle ideals — transformation and growth. Pritzker Laureate Shigeru Ban included solar panels and a green roof in his prototype design for Make It Right — a 2009 modified version of the original Katrina Cottage that Ban calls Furniture House 6. Steve Mouzon is a proponent of "common-sense, plain-spoken sustainability," or what he calls Original Green. Green architecture and good design are not new concepts. Before the heating and cooling systems of what Mouzon calls the "Thermostat Age," builders created sustainable structures through design — without today's "gizmos." A simple front porch extends the living area to the outside; a pretty railing makes the structure lovable. Today, Marianne Cusato's designs take a traditional exterior form, which seems to hide the automation she evisions for the house of the future. "We are seeing a new approach to home design that focuses more on how we live in a space," Cusato has said. Interior spaces likely will have open, yet defined floor plans; flexible dining spaces; and drop zones that compartmentalize living areas. Don't toss out traditional design just yet. Homes of the future may have two stories, but how you get from one floor to another may involve modern technology — like, for instance, a pneumatic vacuum elevator that may remind you of a Star Trek transporter. Walkability — "Much like with the Katrina Cottage, homes will be designed for people, not parking. Garages will shift to the side or back of the house and elements like porches will connect homes to walkable streets. Recent studies have shown that the walkability of a community is a primary factor in raising house values." Look & Feel — "We will see traditional forms merge with clean modern lines." Size & Scale — "We will see compact plans. This does not necessarily mean small, but rather more efficient and not wasteful with square footage." Energy Efficient — "Green washing will be replaced by quantifiable building practices that result in tangible cost savings." Smart Homes — "The Nest thermostat was just the start. We will see more and more home automation systems that learn how we live and adapt themselves accordingly." Cusato is the author of Get Your House Right: Architectural Elements to Use & Avoid (Sterling, 2008, 2011) and The Just Right Home: Buying, Renting, Moving — or Just Dreaming — Find Your Perfect Match! (Workman Publishing, 2013). All About Floor Plans: Where Are the Rooms? Where's the bathroom in a wall-less house? 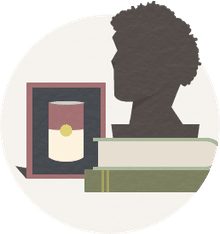 What Types of Buildings Made Up the Classical Greek City?